Every conference has its own special flavor, and this one came with Bay seasoning and a keen interest in 3D Modeling. 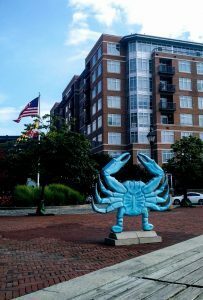 Baltimore, Maryland, home to deservedly famous crabcakes, was the venue for the 2017 Computer Science Teachers Association (CSTA) conference. NCLab is at home with this crowd, sharing a passion for teaching computer programming to all students. However, this year, the teachers were most interested in our 3D Modeling course. 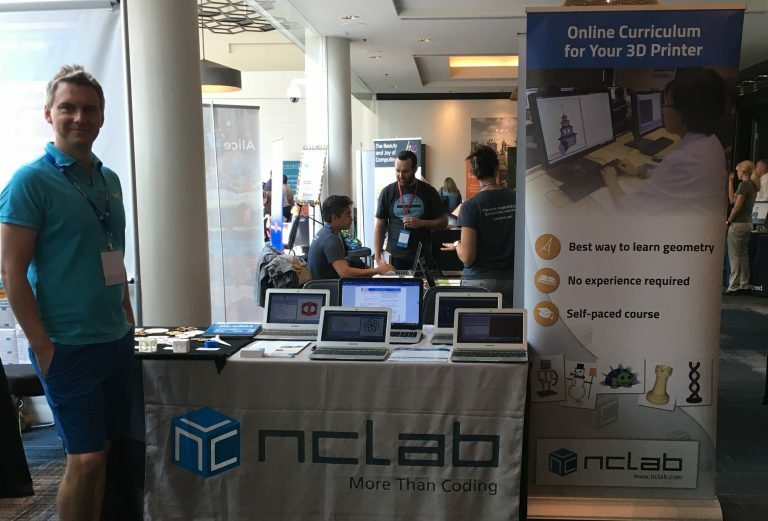 Whether it was a question of what to do with that 3D printer collecting dust in the closet, or an understanding that the 4th Industrial Revolution requires new skill sets from our students, 3D Modeling made a splash in the Baltimore’s Inner Harbor. 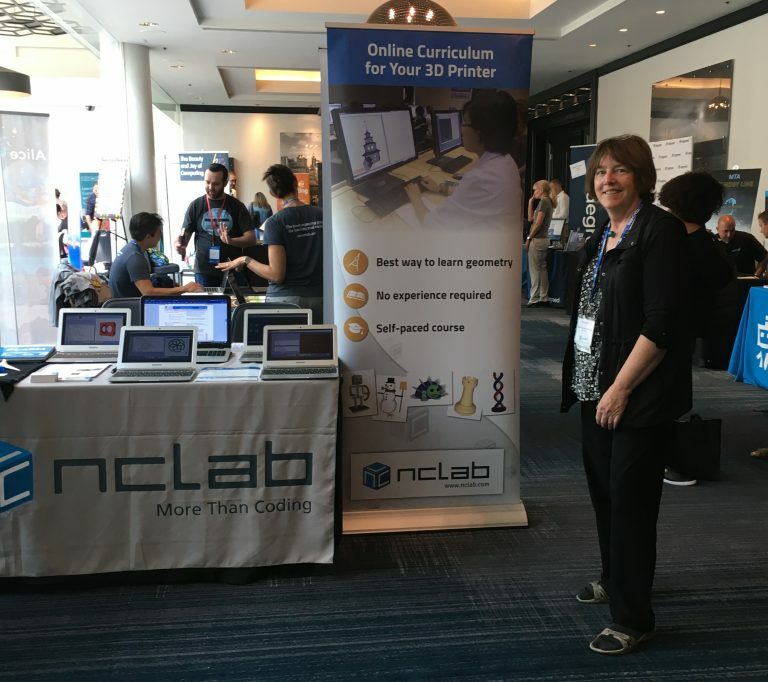 For two days, a non-stop stream of teachers, coaches, and administrators visited the NCLab table and talked with Vas, Amy, and Sheila. This crowd of veterans and novices alike appreciated NCLab’s unique combination of scripted CAD and self-paced problem-solving. Karel and Python I teach logical reasoning and introduce students to programming in a gentle, visual manner. 3D Modeling does the same for visual spatial reasoning and computer based modeling. Core concepts in geometry make much more sense to students when they can manipulate geometric figures in real time. At the same time, while building cool models of everything from drones to favorite characters, students are being prepared for advanced computer-aided design, manufacturing, and engineering. 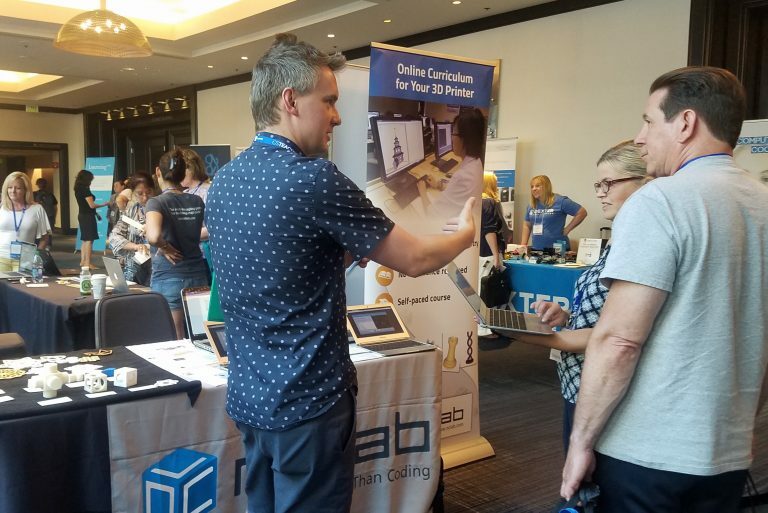 Vas and Amy discuss 3D Modeling with teachers at NCLab’s table. Sheila looks forward to modeling CSG ( Constructive Solid Geometry). Vas is ready for the CSTA crowd. This conference was also an opportunity for us to meet and learn from the architects of the new Computer Science standards. The CSTA standards are based on the 2016 CSForAll framework. While the framework discusses computer science in general terms, the standards provide specific and observable guidelines for Kindergarten through 12th Grade. The standards are divided into five grade bands: K-2, 3-5, 6-8, 9-10, and 11-12. Each standard is spiraled, meaning that the same concept and skill areas are reviewed and advanced in each successive grade band. In the early grades, students practice logical reasoning through concrete activities and very simple computer games. This prepares them for simple drag-and-drop programs in the 3-5 grade band, and scripted programs with more advanced concepts in middle school. NCLab courses are a good fit for Algorithmic Thinking and Programming from middle school onward. Our hats are off to the many thoughtful people involved. 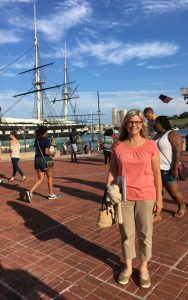 In the evenings, we enjoyed the sights and sounds of the harbor, and sampled Maryland’s famous crabcakes – flavored with Bay seasoning of course. The 2017 CSTA conference was a great success from many perspectives. We look forward to the 2018 conference in Omaha, Nebraska, where we will be sure to try Omaha’s famous steaks! 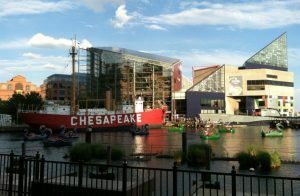 Baltimore Harbor, looking toward the Maryland Science Center. 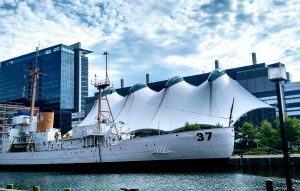 “The Last Survivor of Pearl Harbor” – the US Coast Guard cutter Taney is on permanent display at the harbor. Amy enjoys an evening walk around the Harbor. Homage to the blue crab, the key ingredient in delicious crab cakes.